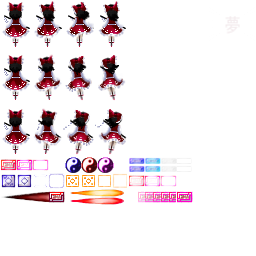 The Reimu and Marisa sheets are based off of a fan game idea of mine so they're styled accordingly. Due to real life priorities, I am not taking any requests at this time. My apologies. If there's an issue with the sheet please let me know and I'll fix it. Ahh, I've seen your sprites before. I rather like them! If you don't mind my asking, why are the Nansei sprites off-limits? As for your STG frames/layouts, they are amazing! I love them! Fantastic job on those! Try to keep the sprites in a consistent grid, preferably in sizes that are divisible by 8 (not required). Actually, video cards just love it when your textures' sizes are powers of 2 (many of them even refuse to work otherwise). By extension, sprites are usually made with "good" sizes too, though latter is not that necessary. This is related to how video cards process these textures. Let's say... it's just a lot easier when you can cleanly divide by 2 all the way down to 1. Sometimes you are allowed to load non-good textures as well, but it's often done with a whole spectrum of limitations and drawbacks. For example, D3DX, when is asked to load a texture from a wrong-sized file, creates a good-sized bitmap in memory and then resizes the input image to the target bitmap that way so, when drawn with original image size, original picture is reproduced. Though, when used with sprites, this technique may introduce some nasty artifacts. Here's an example. I have created two textures, the first one being of good 8*8 size, and the second one being ill 12*12. Then, I asked Direct3D to draw left-topmost 4*4 regions of both textures. Here's how it looks with the good texture. We see exactly what we intended to show. Here's how the bad texture works. Colors from neighboring regions flood into our sprite. Why does it happen? Because, during loading, D3DX resized our 12*12 image to 16*16 texture, so texels' boundaries are no longer where we wanted them - instead of whole 4 texels we see about 5.3 of them which correspond to our desired region. 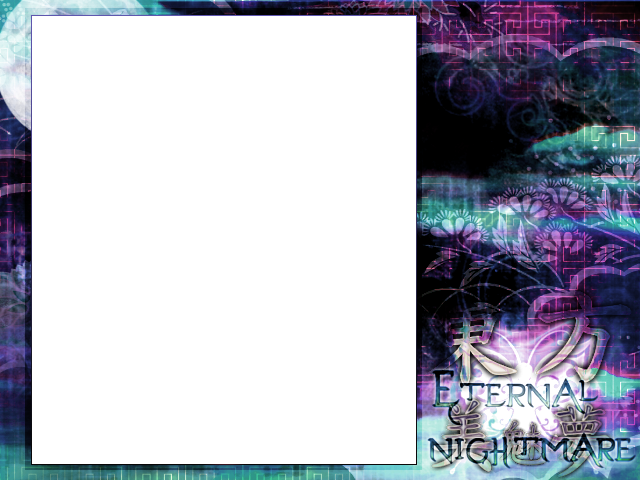 To add more clarity, here the full texture is shown. As we see, it's size is actually 16*16, not 12*12 as we originally intended. Though, if I put this texture on a 12*12px square, I would get the original image. To make the point more evident, it this example I used a rather large size for sprites and effectively disabled magnification filtering, so we can clearly see the boundaries of texels. Still, even with default linear filter and near 1 pixel-to-texel ratio, we still can see this color flooding artifact near our sprites' borders. 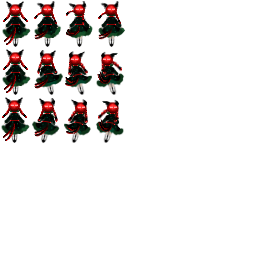 However, as I said earlier, nothing stops us from putting arbitrary-sized sprites in a good-sized image. Still, traditionally, the whole texture is usually divided into a right grid, which makes individual regions to have power-of-two sizes as well. 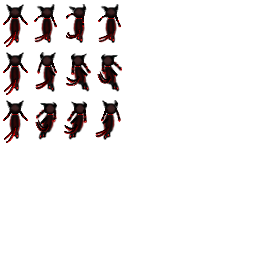 As an example, here is a sprite sheet from guess what. As you see, 256*256 texture is divided into 4*4 grid, making each region 64*64px in size. [UPD] oh wait what that's 4*3 grid, okay, bad example, imagine this one was never mentioned [/UPD] Here is another sheet from the same game. Some of the grid cells are further divided to make space for smaller objects. As for the whole texture size, it's usually 256*256, though I remember creating several huge 4096*2048 texture for some bitmap Unicode font. They weren't all loaded at once, though. So, that's how sprite sheets are made in real good games. P. S. You are welcome. Changing the actual texture size to a power of 2 isn't hard to do, which was why I didn't mention it, since I didn't want to get technical about it. Thinking about it, it's probably important to mention it, for when designing the layout of the sprite sheet. I'd like to echo those details for Fulisha of Light to keep in mind for future sprite sheets. P.S. why the link to Drake's thread? I thought somebody could wonder where the touhou examples were taken from. Well, that at least explains where the legs of these grids grow from. I don't know about the sleeve, but I will look into it and fix it and the sword (maybe shrink it down a bit since Delfigamer mentioned the grid sizes; I always tend to make things too big ). I'm still trying to find the right speed for the sprites so it flows like in the game. Unless the frame by frame animation is off. Iyona's sprites got corrupted? That shouldn't happen. Did you try saving it again? I think I understand what you mean. I guess I'll have to resize them a bit and layout a grid then? Great, now someone can make actual games out of the Nansei Project. Understandable. I can't remember where I read it, but I think she got a group of people to finally make a game for Nansei? 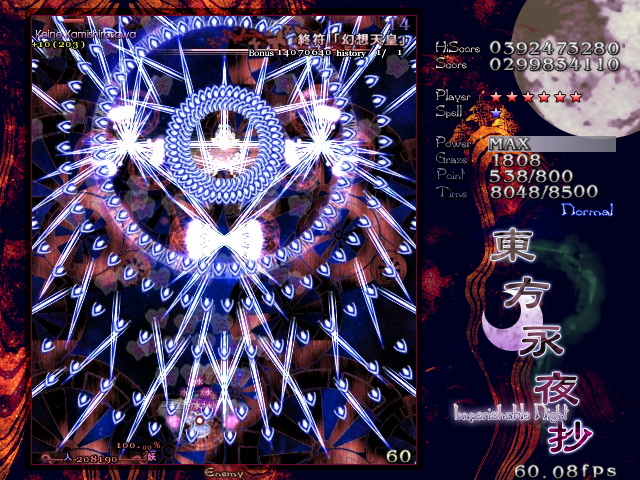 I haven't actually checked ZUN's animation speed frame by frame, but when I (personally) animate ZUN's player sprites, I have the idle animation running at 1/10th of a second for each frame (6 frame delay when running at 60 fps). For movement, I run it at 1/15th of a second (4 frame delay at 60fps), but the first four sprite speeds are doubled (1/30th, 2 frame delay at 60fps); it then loops to the 5th sprite. I did indeed mean the frame by frame animaion was slightly off, as in the smoothness of the animation. Most of them were fine (Chen's was great), but Kaguya is kind of all over the place with her skirt. However, this could also be because of the placement of the sprites, I'm not sure. Definitely work on the grids, as it seems as though Iyone is in a 65.25x100 grid, I think? Try to stay away from decimal placements. 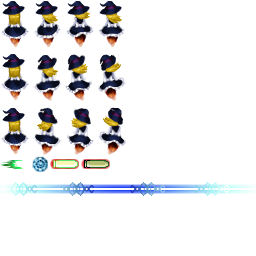 The placements of the sprites themselves aren't centered on the grid, so she teleports slightly left and right during her animation. Oh really? That's the first I've heard. Maybe I'll ask her more about it. Oh! 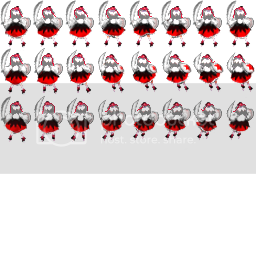 The (player) sprites actually were 256x256, but I cut off the rest of the image because I didn't make them their shots yet (and all that would be there for shots is Reimu's because I used her format as a base). 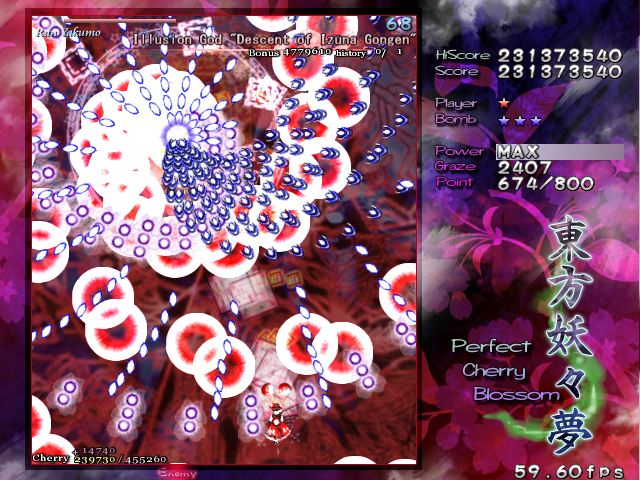 Considering shots, how about sword slashes like TD Youmu's unfocused? No ideas about her options. Aside from maple leaves, which seem rather far-fethed for me. Referenced from Flandre's MUGEN sprite (those crystals took forever to do so hopefully they're consistent OTL). Had some issues with my files last month (as I keep everything on a USB) where I thought I lost everything due to some weird error, but I managed to find it all and put it on a new USB unfortunately, I haven't gotten too much done, only some small things here and there. Personally I think the sprite's fine, really cute! On another note, does Flandre really flap her wings? I thought they weren't even real "wings", to begin with, and weren't made flexible. I once heard that those are simply decorated metal tubes that Flandre augmented herself with to look more like her actually bewinged sister. Not like I've seen much proof of it in the canon; though this though probably did influence my image of her. The only thing noticeably awkward for me is the hat twitching to the right every loop or so. 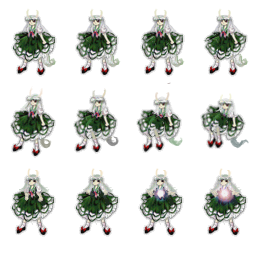 It's based off of Reimu's dress, but it's not the sprite exactly (it looks similar, but it's different as I tried to make it look that way). 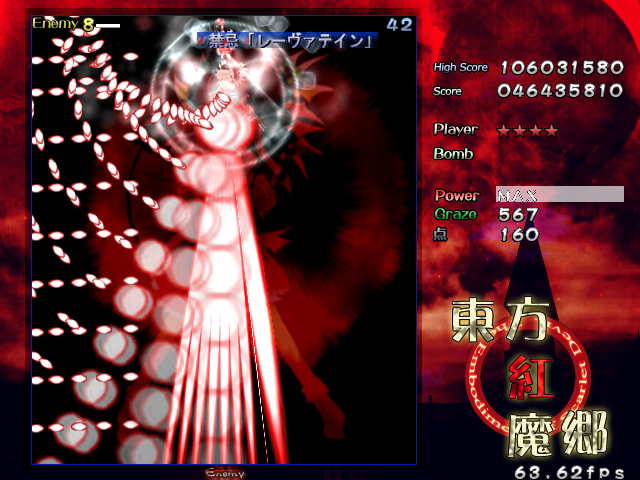 I thought Flandre was able to flap her wings ZUN's sprite of her in StB has her flapping them if I'm not mistaken (though it was a little more stiff). How do you make such impossibly beautiful and authentic layouts? I can't possibly make something even half as good as that. A lot of time and a lot of experimenting with various textures, hues, and combinations mostly. Oh, thank you thank you thank you!! There were no Chen-Player sprites in the internet in previous year! And you alone changed it! Reviving this thread with some newly updated sprites and a notice, so check out the OP for everything up-to-date. Had to completely move everything I made to Imgur because of Photobucket no longer allowing third-party sharing and also some loss of files. All of the old sprites I made and posted in this thread are going to be archived and no longer updated. I will consider revamping them to match the newest batch here in the future though, so don't feel down about it. 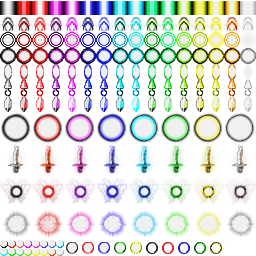 Any of the sprites posted here by me are free for anyone to use as long as you contact me first and give credit when used. I can post freely again, yay the 500 curse has been lifted! I also plan on releasing all of my Nansei game frames for anyone to use once I manage to revamp and complete them all.